More and more people are choosing tankless water heaters over traditional tanks these days, and for good reason. Tankless heaters use gas or electricity to provide hot water on demand, reducing standby energy losses that cost you money. 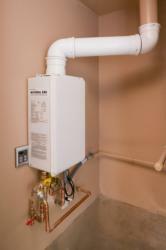 In addition, tankless heaters typically last about twice as long as standard heaters. However, your tankless heater needs to be professionally installed for optimal energy efficiency, and no one knows tankless heaters better than we do. Plus our experience and relationships with suppliers allow us to offer all parts and labor at unbeatable prices! We start by determining your demand, location, and application for hot water, then we customize a system designed to fit your needs and budget. For more information or to receive a estimate, please contact us today.